Discussion in 'Parts for sale' started by ToddsGS, Feb 24, 2018. Made by Lectric Limited right here in the USA! These sets are identical to the spark plug wires as they would have appeared on your vehicle when it shipped from the factory. They look, fit, and perform exactly as original and provide the finishing touch for any original or restored vehicle. All sets include the coil wire. Manufactured from the original manufacturer (GM, Chrysler, AMC) specifications/blueprints. Wire Conductor: original wire type (carbon-core). Wire Color: original color (black, gray or brick red). Wire Lengths: original wire lengths. Wire Script: original script nomenclature. Wire Script Color: original script ink type and color (white, black or yellow). Wire Braiding: original machine-applied metal braiding (only 1965-74 Corvette big block with radio). Wire Manufacturer: original manufacturer (Packard Electric®). Wire Date Code: original date code (if applicable). Terminals: original configuration (45°, 90°, 135° or 180°). Boot Color: original color (black, gray, brown or orange). Boot Type: original size, shape and configuration (45°, 90°, 135° or 180°). Priced at $69.00 plus the Shipping Fees. Die Cast Websites Simple – and Secure Online Order Form . . . . . . . LINK HERE. This is the same Order Form my Die Cast Customers use. It's Simple & Secure. Item would ship out same day if you use a Credit Card. Invoice included with each Sale. Shop Hours Monday - Friday 1 pm to 6 pm Central time. 1000's of Buick GS/GSX/Skylark Fasteners now available on my website. These are NEW fasteners, and Made in the USA. King of Torque – “You’re Gonna Need a Bigger Hemi” Banners, License Plates & Stickers, Buick Console Decals & More! 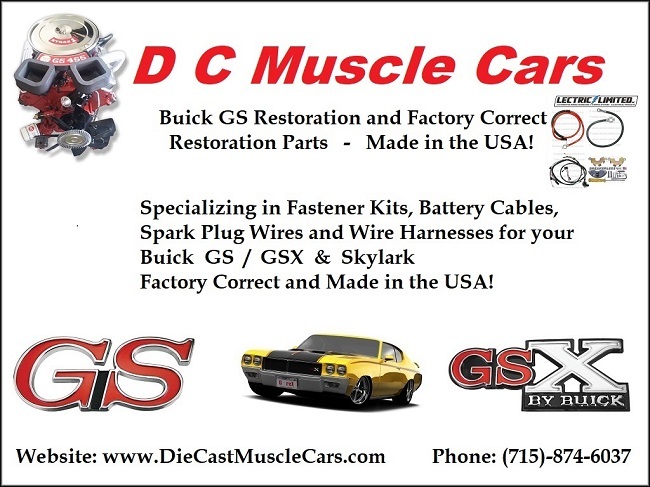 See our products here > D C Muscle Cars – Done Correct!. I know this is not a Buick, but do you have a complete correct body bolt kit for a '69 Z/28RS? I may have the correct body bolts in stock but since I'm not familiar with the Z-28s I would need to do some checking on the size and quantity. The Buicks require two sizes so that is what I have in stock. I can check on Monday if you would like? I did some checking today on a couple Camaro's we have in the shop and I do have the Correct Body bolts in stock. (Sub Frame to Body) Not sure if that's all you needed or if you needed a complete body (Doors, Fenders, Hood, Deck Lid etc.....) type of kit but most of what I have here for our Buicks would probably work on the Camaro's as well. I do not have a Kit for them though. Pretty much just specialize in the Buick's. Let me know if you want to proceed with any of the above mentioned items. For what it's worth, I've got a set of these same wires on my '71 455 motor and they look and function great. The lengths are perfect to run along the valve covers just like factory originals. I can't wait to install these. Who makes correct spark plug retainers? T/A lists them in there catalog? If I recall correctly they list two different ones. Not sure if it was TWO HOLD OR THREE. I can attest to the quality and fitment.